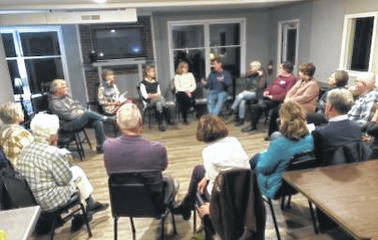 MOUNT VERNON — Presented by In the Circle of Life and sponsored by Hospice of Knox County (HKC) and Kokosing Nature Preserve, an awareness and education discussion series on death and dying will continue Thursday, Dec. 6, at 6:30 p.m., and continue monthly through May 2019. In the Circle of Life is a non-profit organization with the mission of guiding others to a deeper understanding of death to help release the fear of dying and inspire them to an enriched, authentic life … with the end in mind. The discussion series is facilitated by Jacki Mann, RN, a certified hospice and palliative care nurse currently at Hospice of Knox County, a living and dying coach, and a death doula with more than 30 years of in-home care and hospice nursing experience. “We are an aging population of a magnitude never before seen. Changes to our approach and the silence around the subject of death needs to change now,” Mann said. The topic for the Dec. 6 session is Advanced Directives and Beyond and will include an opportunity for participants to put their end-of-life wishes in writing and learn more about the necessary documents to communicate those wishes to surviving loved ones. Topics at the following meetings will include Being Mortal documentary and discussion on Jan. 24; Our Culture’s Death Phobia on Feb. 21; Being with Dying on March 21; A Will for the Woods on April 25; and Hospice: What it Is, What it Isn’t on May 30. Held at the Kokosing Nature Preserve Reception Center at 10620 Quarry Chapel Road in Gambier, this discussion series is free and open to the public. For more information, go to www.inthecircleoflife.org or call 614-648-8897. Hospice of Knox County is located at 13300 Coshocton Road in Mount Vernon. It is a member of Hospice of North Central Ohio which serves more than 200 patients daily in Ashland, Crawford, Huron, Knox, Morrow, and Richland counties with palliative and hospice services. Additionally, free bereavement services are provided for hundreds of families of hospice patients and anyone in the community experiencing grief. Call 800-952-2207 for more information. HKC is a community agency of United Way.